Cultural support for fatherhood has collapsed in the past 50 years, and there are few signs of a renewal. In light of this, how can fathers summon the courage to fulfill their mission? Their mission is two-fold: to love their wives and commit to providing for the total welfare of their child. Each of these requires from men a conscious attitude of self-giving love. This admirable attitude does not come always naturally to us, and it is increasingly under siege in our culture that emphasizes independence and self-fulfillment. An attitude of self-giving love is built on the truth that members of the family are dependent on one another: spouses are dependent on each other and children on their parents. Love, too, is a kind of dependence, where the beloved depends on the lover as they form a community dedicated to common goals. 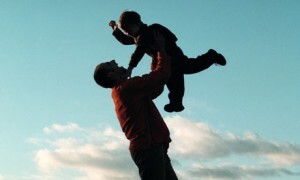 It’s no coincidence that striving to live for the beloved is great preparation for fatherhood. How is our culture’s emphasis on autonomous independence different from an attitude of love? Is that salary yours or is it the family’s? Is the house you live in yours or is it family’s? Is your child’s education his or hers or is it the family’s? Is your time yours or is it the family’s? When these things are yours, you have adopted an attitude of independence; when they are the family’s, you exhibit an attitude of love. For modern Americans, it is hard to avoid the feeling that family gets in the way of our career, that kids are obstacles to prosperity or that we educate our children for prestige and self-serving success. Yet those are precisely the self-centered thoughts that increasingly imperil marriage and family life. Making self-giving love central to our lives is not easy. It begins with seeing the practical day-to-day aspects of our lives within an orbit of love. Mowing the lawn or fixing the sprinkler system is service to the family, not something that keeps you from golfing or watching football. Working overtime to provide necessities or pay tuition contributes to that common life, as does devoting time to your kids on weekends. Sacrificial self-giving appears inconsistent with our autonomy, and it is. Autonomy and self-giving are tips of two very different icebergs. In like manner, a husband should be attentive to his wife and appreciate the seeming drudgery she endures to build a life together. Folding socks and other tasks are endlessly repetitive but they are meaningful when seen as contributing to building a common life. Easing her tasks—for instance, doing the dishes—can make your appreciation obvious to all and help build an ethos of common life. Ideas of independence obviously affect our wives, and drawing them back to the reality of your common life with such appreciation is crucial to educating everyone in your family about the values of a shared life. Paternal attempts to cultivate this attitude have important implications for the education of our children. To take just one example, children should not be introduced to recreational dating, with its glorification of personal pleasure and individualism; rather, dating should take place only between those capable of exercising self-giving love, so that self-gratification is subordinated within an atmosphere of a greater good. A father’s attitude toward his marriage is a key to instilling the concept of true love in his offspring. Having children begins with an act of love; raising children is a more difficult expression of a deeper love, for which the marital act is a preparation. In our media-saturated age, a father must monitor and seek to limit the type of messages that come into the home through TV, radio, internet and social media. It is a difficult task, for sure, to keep your kids from the worst that is out there, but it is an important job since so many messages today undermine a parent’s influence and authority. Family life is a worthy mission deserving of our best effort every day. You and your wife must work together and not expect much help from others. Few cultural outlets, aside from the Church and family organizations like the Knights of Columbus, help men complete this mission successfully. Ultimately, each of us has to build within ourselves a culture of self-giving love before we can start to build a better world based on that love. The future of our civilization depends on men who build better for themselves and their families. Scott Yenor is Professor of Political Science at Boise State University and author of Family Politics: The Idea of Marriage in Modern Political Thought (Baylor University Press, 2011). He lives with his wife and their five children in Meridian, Idaho.